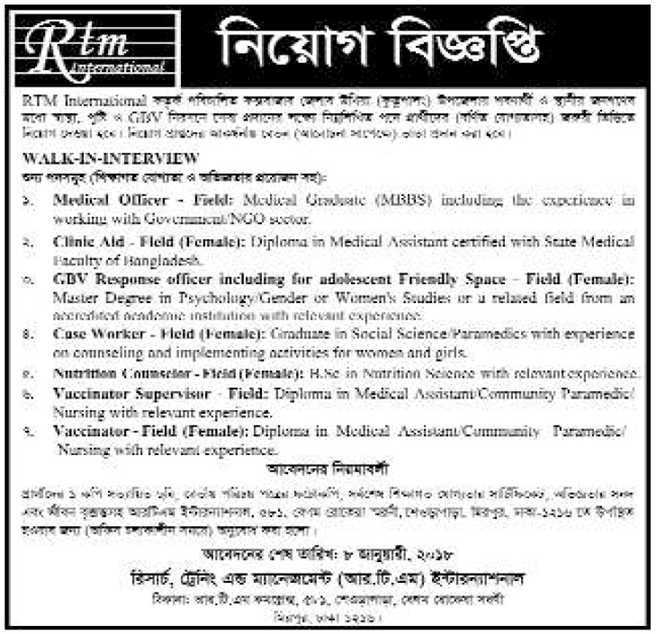 RTM International job circular 2018 has been published.If you are unemployed You can join to this job. RTM International is a non-profit organization registered with the Government of Bangladesh. It provides high quality technical and information support to the institutions/concerns working in health, education and environment development sector for the design, implementation, and development of local capacity. It was established as an independent NGO in 1994 with the name ‘JSI Research and Training Institute, Bangladesh (JSI Bangladesh)’ and as an affiliate of John Snow Incorporated, a leading public health organization incorporated in the USA. JSI Bangladesh used to receive technical cooperation and partial financial support from JSI USA.